I really enjoying seeing photos from customers that show how they finished the glitter house kits. Thank you for sharing your lovely work, Mary and Marie-Louise! More photos from customers may be seen in the Customer Gallery. Feeling inspired to grab the glitter and customize your own glitter house? Enter the True2Scale Glitter House Contest! Share your creation and you could win a prize. Mary's kitbashed Little Village Painted Lady House. 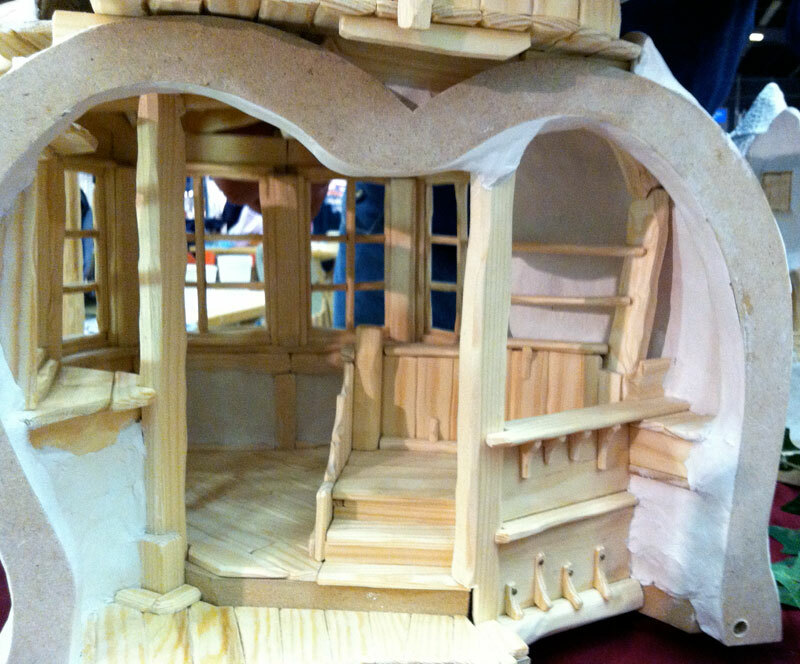 Mary Broaddus customized the Little Village Pioneer House. Marie-Louise Markhorst's mantel scene with the Snow Village Cottage. We had a successful and enjoyable trip to the Madrid show. Our very limited Spanish vocabulary was a bit problematic, but the shoppers were patient and very kind to us! Mr. True2Scale and I met some fellow bloggers and blog readers and truly felt welcomed in Spain! The show provided another opportunity to see the work of many artists that were previously unknown to me. LxL Cruces offered beautiful jewelry and other finely detailed items. 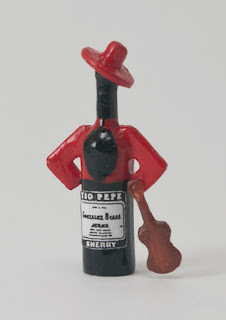 I purchased a souvenir from Spain — a miniature bottle of the famous Tio Pepe (Uncle Pepe)! If you are not familiar with Spain’s famous sherry, LxL offers a short explanation. 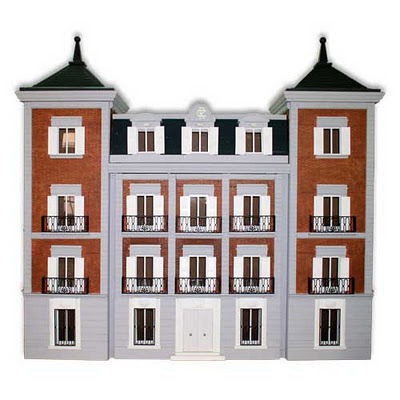 Casas de Beltrán Escrivá de Romaní (Houses of Beltrán) creates fantastic, custom-made models of Spanish homes found throughout regions of Spain. The architectural details were stunning! Beltrán will ship to international destinations and have some great photos on their website. Unfortunately, I couldn't add one to my collection, but it was a temptation! Casa Madrid Austrias I by Beltran Escriva de Romani. Cristina Alberti, from Tot Petit, creates dolls, plants, paper theaters and toys, books and other lovely items. Clémence Gibert Miniature Furniture occupied the table next to us. She creates fantasy, inlaid-wood furniture that is is inspired by the Art Nouveau style. Woods she uses include walnut, pear, maple and zebrawood. There was one table that I could have stared at for hours! In fact, I returned several times to admire the work of Artesanos Felipe Royo. 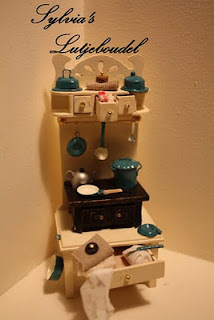 Their tile, furniture, painted objects and sewn pieces are all handmade, and of beautiful quality. After several rounds of deliberations, I finally chose a chandelier for the bedroom of the Tuscan house. The light fixture is just taped in place now, but I will wire it with an LED. 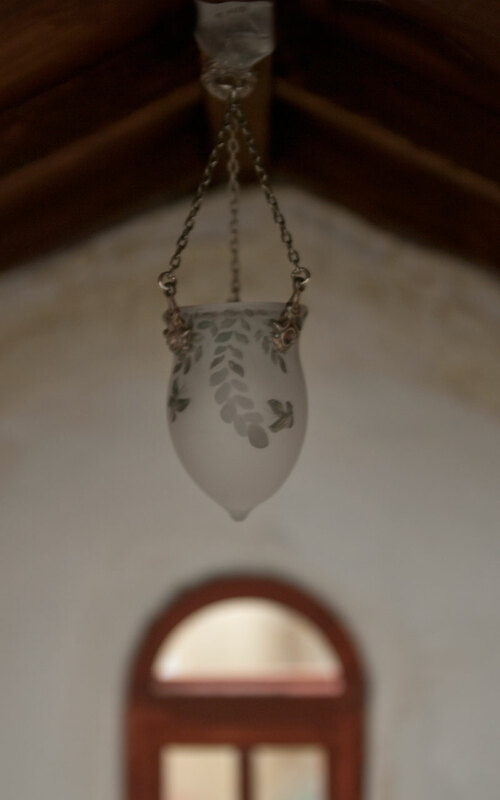 The chandelier is handpainted with a motif of butterflies and vines. I think it will add a feminine touch to the room. If you will be attending the Madrid show this weekend, please stop by our table and say hello! A sorcerer? witch? hermit? Perhaps a creature from the forest? 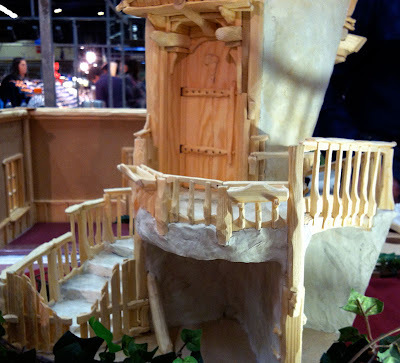 As I viewed the custom, fantasy dwellings created by Bas Middel of Poppen(T)huis, my imagination started to take flight! 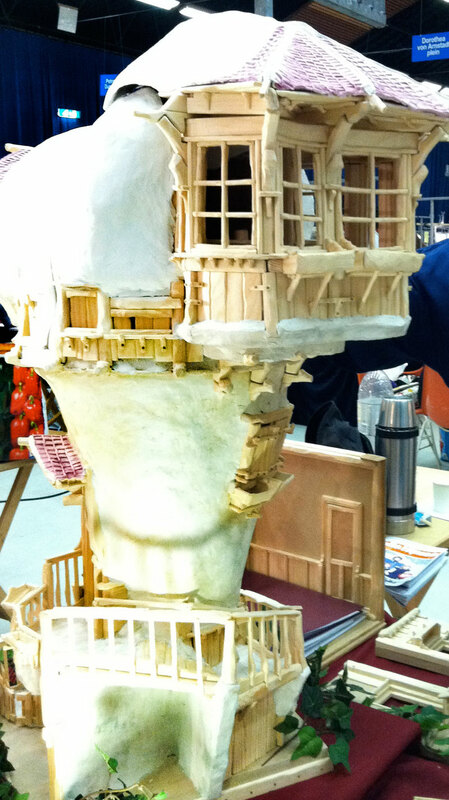 Bas's structures are handcrafted from wood and clay. Even the hinges on the doors and shutters are created from wood so that your attention isn't taken away from the natural forms. The interior of the top floor. I love all of the built-in niches! The interior of the bottom floor and stairway. Bas Middel and his fantasy creations at the Arnhem fair. We returned from Amsterdam last night. I am jet-lagged (I started writing this at 4 a.m.), but full of excitement and inspiration. 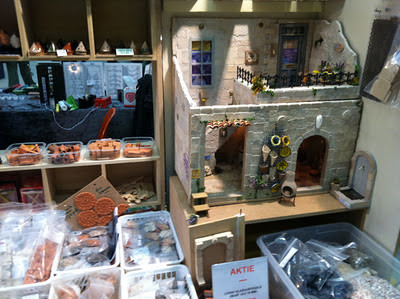 I couldn't wait to sit down and write up an account of our experiences at the Arnhem fair. The Arnhem Poppenhuisstad was the first time I was able to see the work of European artists other than that of the artisans who make the trip to the Chicago International. Mr. True2Scale manned our table alone often, so I could see the tables of some of the approximately 200 dealers. I am certain that I didn't see all of them; but the work of the ones I saw, and their kindness made an impression on me that I won't forget. Mr. True2Scale is pretending to be a miniature display. Our table was near the back of the hall, on the end of a row. Our neighbors were so kind and helpful. Next to us was J en M (email). 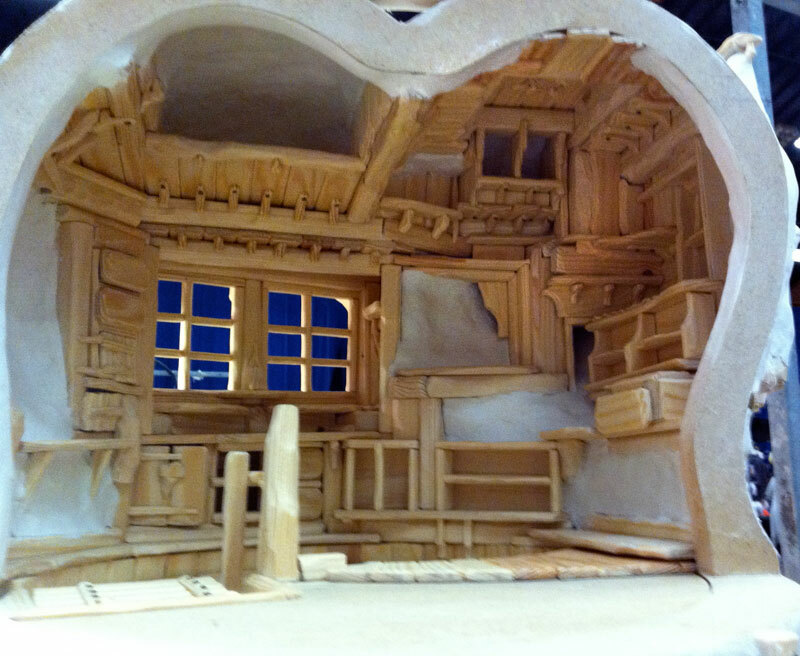 He creates small wooden objects; mostly toys, puzzles and children's lights, with incredible detail. 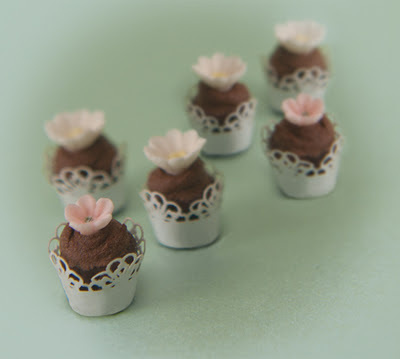 Carla Zandvliet (email) makes beautiful flowers and Christmas decorations from silk. They are very fine and have a translucent quality. Behind us was Fennicole Miniatures. Such nice people! Their popular table contained many things that I haven't seen before in the U.S., including unusual shaped flowerpots, wall pockets, tiles and items for landscaping a French scene. Fortunately, some of the items also work well in a Tuscan house and found their way to my suitcase! And then there was E. Elsner von Gronow, from Germany. I purchased some embossed metal borders (made mostly by hand in Germany) and tiny filigree ornaments. Piamini, from France (email), offered unique metal and wood items including folding chairs, tables and benches for the garden. 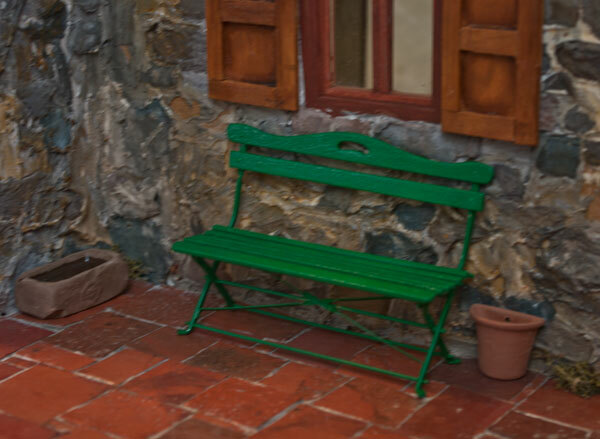 I purchased a green bench for the Tuscan house. Such kind people! Garden bench by Piamini; some of the pots from Fennicole Miniatures. Volker Arnold, whose work I have always admired at Chicago International, had a large display and many items that I hadn't seen before. I purchased a couple of his tiny Santa's sleighs. He was kind enough to take a photo with me (I was too shy to ask for his autograph as well – ha ha). 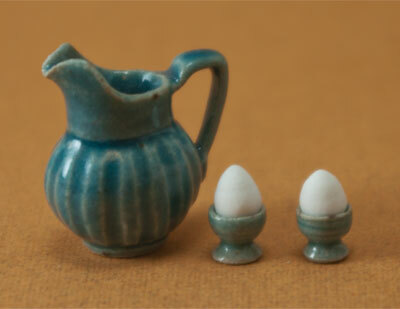 Elisabeth Causeret (email) from France had a beautiful selection of 1:12 and 1:24 scale porcelain to choose from. It took a long time to decide on which items I couldn't live without. Finally, I bought two egg cups and a pitcher. Sylvia's Lutjeboudel offers Brocante style furniture kits in wire and wood. Her kits are so charming and unique! I purchased a baby carriage and an antique toy kitchen that includes directions and supplies to make a toy stove, cabinet and cookware. Sylvia is such a kind person and introduced me to many new Dutch customers. I owe her a big dank je wel! Lara and her daughter stopped by to say hello. Margriet also came by. I had pleasant conversations with the talented Michelle Lebouteiller of Petits Bonheurs and Pia Ravn from Denmark, who both make lovely items. Another interesting artist whom I met is Sherpa. 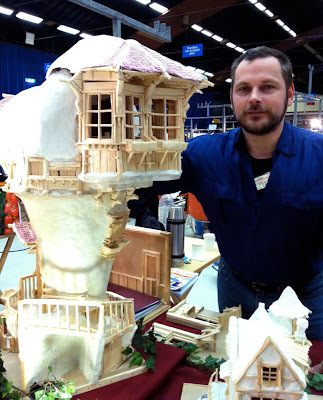 He creates gothic-inspired miniatures. He showed me a coffin that he made into a ladies' purse - truly creative and fantastic! Close to our table was Poppen(T)huis. Bas Middel creates custom fantasy houses from wood and clay. 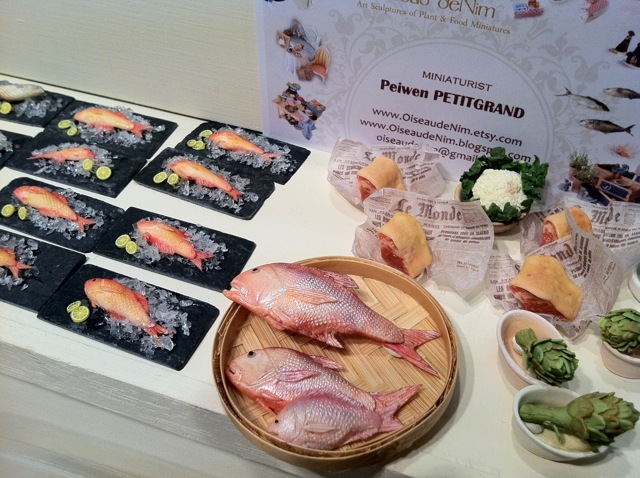 I took several photos of his displays that I will share in another blog post. Mr. Bea/Tony Broadwood from Petite Properties found a new customer. 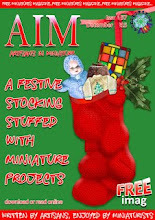 I decided to plunge into 1:48 scale and purchased a kit and books for making a shop and furniture. 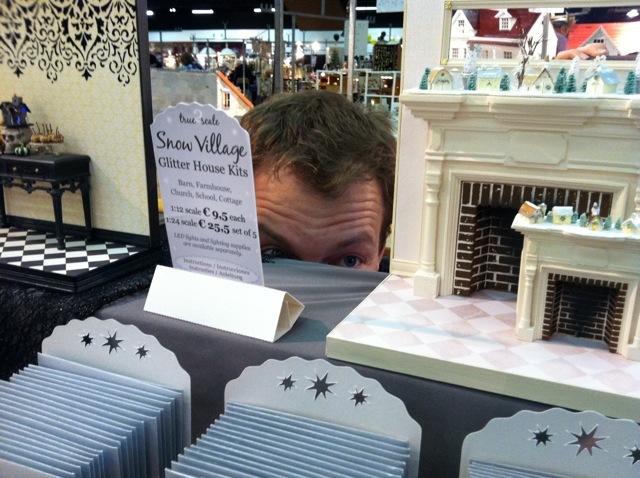 Maybe I'll pick up some new skills for quarter scale and offer 1:48 glitter house kits in the future...mmmm...maybe. 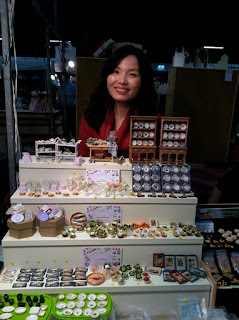 While we were setting up our table on Friday, I met Peiwen of Oiseau deNim. If I hadn't recognized her face from pictures, I would know it was her by the Ladurée bag she was carrying! 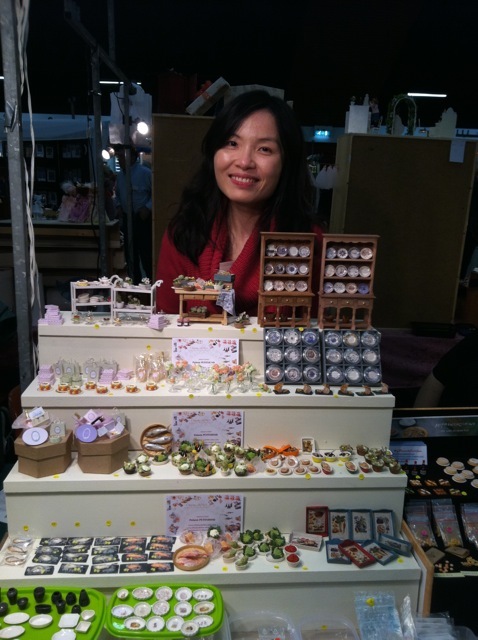 Peiwen's table was nearby and it was full of fantastic items. Her fish and artichokes are ...oh my! She has been doing a lot of vegetables lately and they are incredibly realistic. And Peiwen is every bit as charming and charismatic in person as I had imagined! If you have the opportunity to meet her, you will find that her energy is contagious! It was fun to share our first fair experience together. The Ladurée bag that Peiwen gave me contained a box of macaroons and delicious Marco Polo tea. 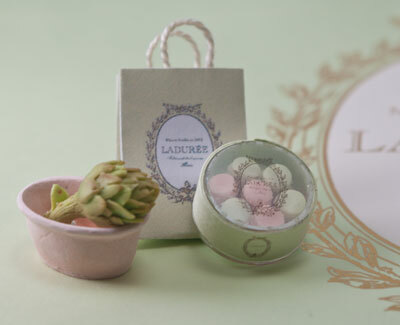 Some time back, I mentioned on my blog that I'd never had the opportunity to try Ladurée. Well, thanks to Peiwen, Mr. T2S and I were in patisserie heaven! As we bit into the macaroons, they melted (yes, melted!) on our tongues. The crisp, slightly sweet outer wafers gave way to the lightest creme filling. The texture and taste sent waves of euphoria through every synapse! We are both back to work today after only a few hours of sleep. 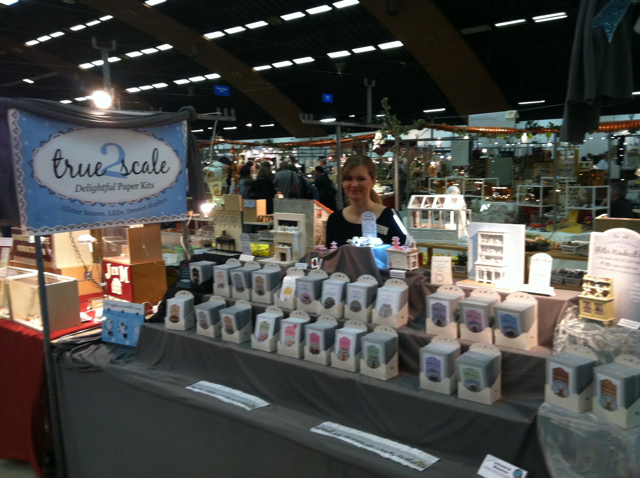 Before we attend the Madrid show, we will have a few days to make some new plans for True2Scale. Perhaps some of the plans will include a visit to France :-) Also, I hope to sneak in some time to work on some of the kits I purchased!